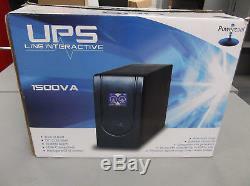 POWERCOOL Smart UPS 1500VA line interactive with digital display. Intelligent UPS battery back-up system. Keeps your PC running when power goes down; allowing you to save important data. Gives 20 minutes backup time at maximum load. LCD display shows full battery status. Automatic Voltage Regulator with CPU control. Protection against surge and over/under voltage. USB Connectivity for software monitoring. Reaches 90% capacity after 8 hours. The item "POWERCOOL Smart UPS 1500VA line interactive with digital display" is in sale since Wednesday, May 23, 2018. This item is in the category "Computers/Tablets & Networking\Power Protection, Distribution\Uninterruptible Power Supplies". The seller is "ajl-containers" and is located in Hyde. This item can be shipped to all countries in Europe, all countries in continental Asia, United States, Canada, Australia.